Rutherford tested Thomson's hypothesis by devising his "gold foil" experiment. Rutherford reasoned that if Thomson's model was correct then the mass of the atom was spread out throughout the atom. Then, if he shot high velocity alpha particles (helium nuclei) at an atom then there would be very little to deflect the alpha particles. He decided to test this with a thin film of gold atoms. As expected, most alpha particles went right through the gold foil but to his amazement a few alpha particles rebounded almost directly backwards. These deflections were not consistent with Thomson's model. Rutherford was forced to discard the Plum Pudding model and reasoned that the only way the alpha particles could be deflected backwards was if most of the mass in an atom was concentrated in a nucleus. He thus developed the planetary model of the atom which put all the protons in the nucleus and the electrons orbited around the nucleus like planets around the sun. An atom consists of nucleus and extra- nuclear part. The nucleus is small positively charged part of atom. It is situated at the center and carries almost the entire mass of the atom. The positive charge of nucleus is due to the protons. Since the number of protons in the nucleus of different atoms is different, so, the magnitude of positive charge on the nucleus differs from atom to atom. 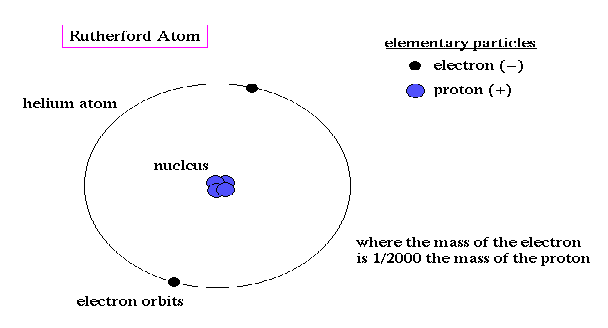 Extra – nuclear part consists of all electrons of the atom revolving around the nucleus in circular paths called Orbits. Atom as whole is neutral, so the number of protons is equal to the number of electrons.